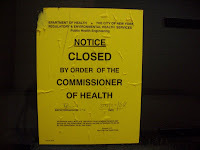 Exhibit A: Don't all gyms have steam rooms closed by the Board of Health for 8 months or so? Exhibit B: There's the never-ending construction... and the day workers who love to ogle while you're climbing the elliptical trainers. Yuck. So I'm thinking these warrant a breakup with Gold's?